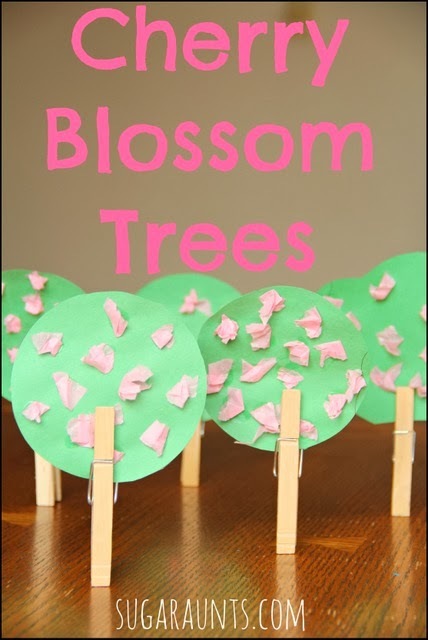 We made these Cherry blossom trees one day as a Spring craft for kids. This was the perfect way to brighten up our dining room. WE had a bunch of paper snowflakes hanging on our window and decided we needed to pull those down and make a few fun spring crafts! 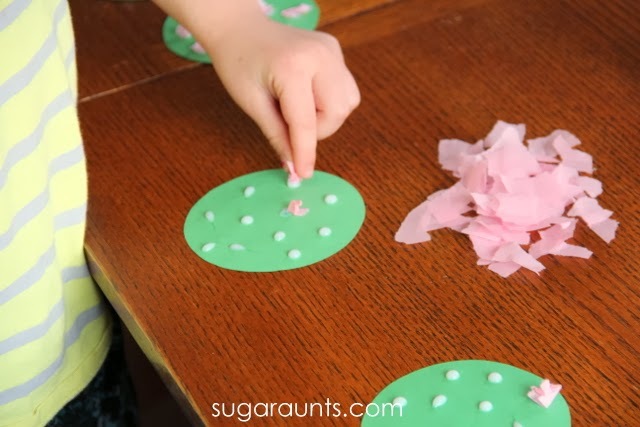 This Cherry Blossom Tree craft hit the mark! Not only were our trees fun to make, they had a great fine motor component to them...and we love fine motor activities! These were cut out and we were ready to get started on our trees. 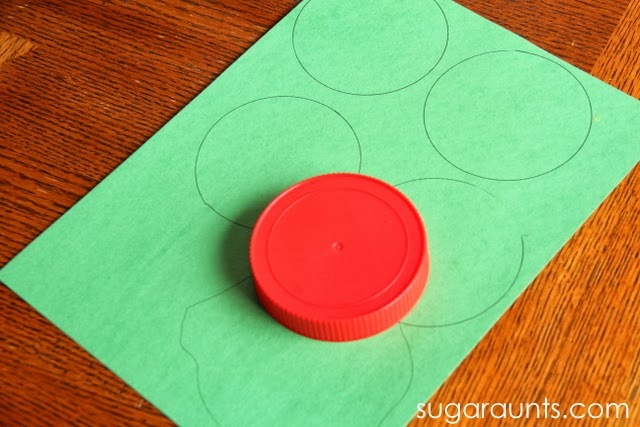 I put a bunch of dots of glue on the circles. Older kids could do this part. 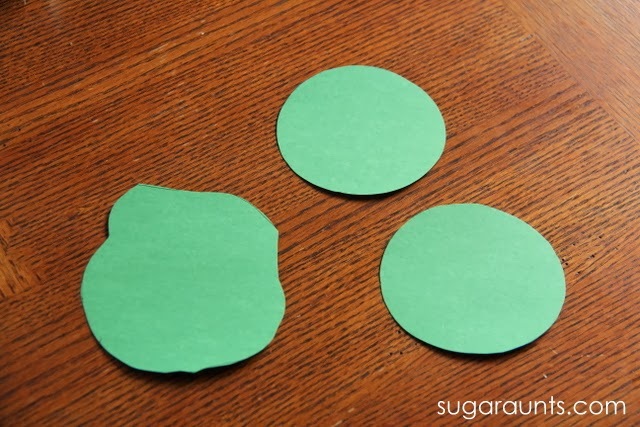 Squeezing the glue bottle is a great fine motor strengthening exercise for little hands. Next, Big Sister pulled small bits of pink tissue paper from a big old sheet. Tearing tissue paper is such a GREAT fine motor strengthening exercise for kiddos. Crumbling those little bits works the intrinsic muscles of the hands (the small muscles that are in the hand and make up arches of the palm. Strength of these muscles is so important to endurance in handwriting and coloring, maintaining adequate pressure when coloring, holding the pencil accurately...the needs for defined arches of the hands could go on and on and on! 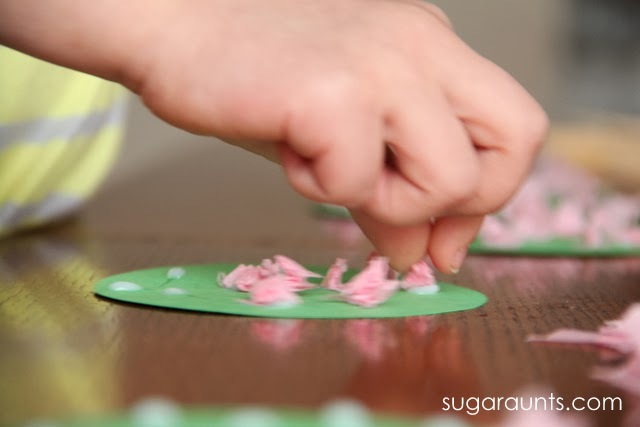 Pressing those little tissue paper crumbles into the glue required a tripod grasp. And, we had a ton of glue spots...so this was a good long activity! Cover all of those glue spots! 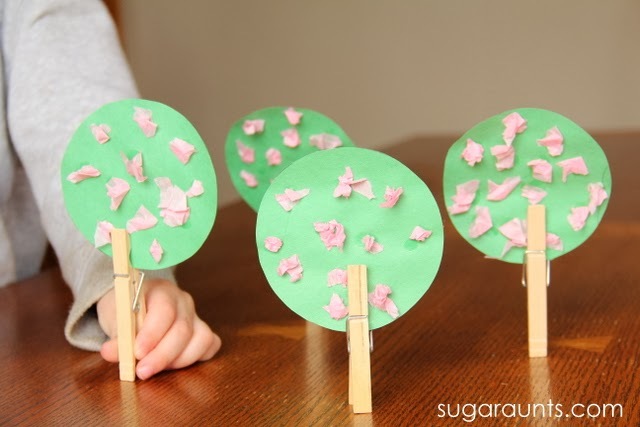 Once our tissue paper/glue was dry, we clipped on clothes pin "trunks" onto our trees. Pinching those pins was another way to encourage hand strengthening. We had a whole forest of Cherry Blossom trees and got them involved on our train table, with the Little People stuff, with little dinosaurs. 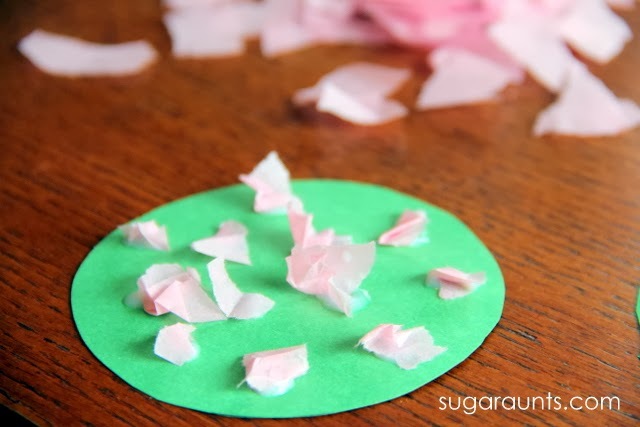 We played with these Cherry Blossom trees until they fell apart! If you make this craft, share it with us! We would love to see your version. You're welcome to share a picture or tell us about it on our Facebook page. 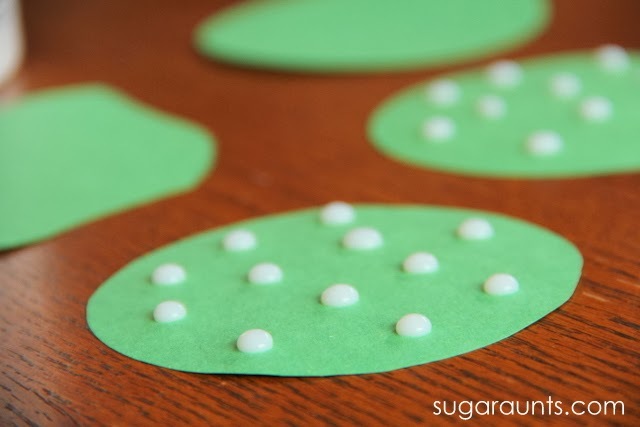 Looking for more Spring crafts, activities, snacks, and fun? Follow Sugar Aunts's board Spring on Pinterest.